Christmas is approaching and many look forward to the cosiest days of the December. For who Christmas can’t arrive soon enough, Yeti Casino created a Christmas Advent Calendar, one different from the traditional version. No chocolates can be found in this calendar because this time you’ll be spoiled Christmas free spins, NetEnt bonuses, casino cash backs, and much more. Today, Gonzo is taking you to present number five on the advent calendar awarding an attractive 15 free spins on Flowers Christmas Edition™. How I loved to open those windows every day, even though it wasn’t a surprise a chocolate was going to be inside. Life was so simple when I was young and we didn’t expect window five to award an iPad. A chocolate was already enough to put a smile on our face. Good times! Now Christmas Advent Calendars have a whole new meaning and chocolates aren’t enough anymore to keep the world’s population happy. Bigger and better is feeding the greediness on this planet. In the case of Yeti Casino, I can only agree with their Christmas Advent Calendar, simply because players deserve to be spoiled. They spent and they lose here and there, the reason players deserve some extra’s from time to time. Or actually often! That’s why the traditional Christmas Advent Calendar was used as an inspiration for Yeti Casino’s 25 Days of Christmas. 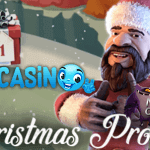 Often starting from the 1st of December, players can already benefit Yeti Casino’s Christmas Advent Calendar for several days which awarded them with free spins for Secrets of Christmas™, a 10% Cash Back, 50 free spins on Fruit Shop Christmas Edition™, a 20% unlimited cash back on all Roulette games, and today it’s the Flowers Christmas Edition™ that’s in the spotlights. This generosity will continue until the 25th of December. 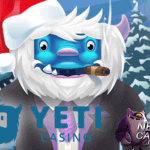 Approaching Christmas, Yeti Casino will be awarding its players every day with a new amazing Christmas Casino promotion and all you have to do is to log in to your private casino account and claim your daily reward. Sometimes a deposit is required in order to receive an amazing number of free spins or an attractive casino bonus. Each promotion will run between 00.00 and 23.59 which means you have until the end of today to enjoy the very first Christmas Advent offer. Let Gonzo lead you to Day 5 of the Christmas Advent Calendar so you’ll be able to find out about today’s Christmas Casino offer. 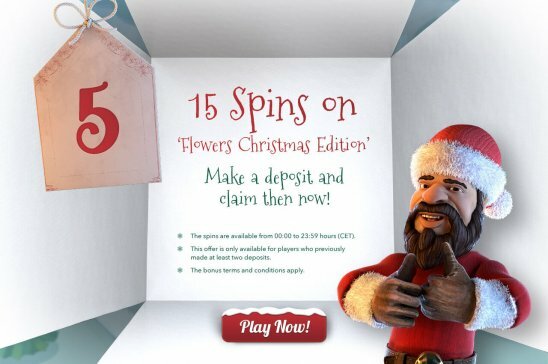 Santa Yeti is again very generous with 15 free spins available on Flowers Christmas Edition™. 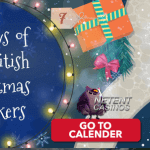 As you can see in the above image, 15 free spins will be available for another Christmassy NetEnt slot available at Yeti Casino. 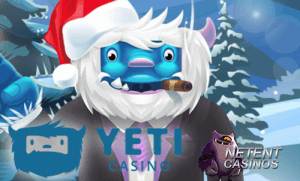 All you have to do is to make at least one deposit at Yeti Casino today and a deposit of €10 is already enough to activate 15 free spins for the Christmas-themed video slot. 23 Free Spins + 100% up to €/£/$333, R3,333, or ₹24,000 with 77 extra Spins. That’s quite an offer I must admit with 23 free spins directly available after registration and another 77 free spins being activated after you’ve made your first deposit while your 100% welcome bonus will be going up to an amazing €333. Christmas apparently arrived at Yeti Casino already!